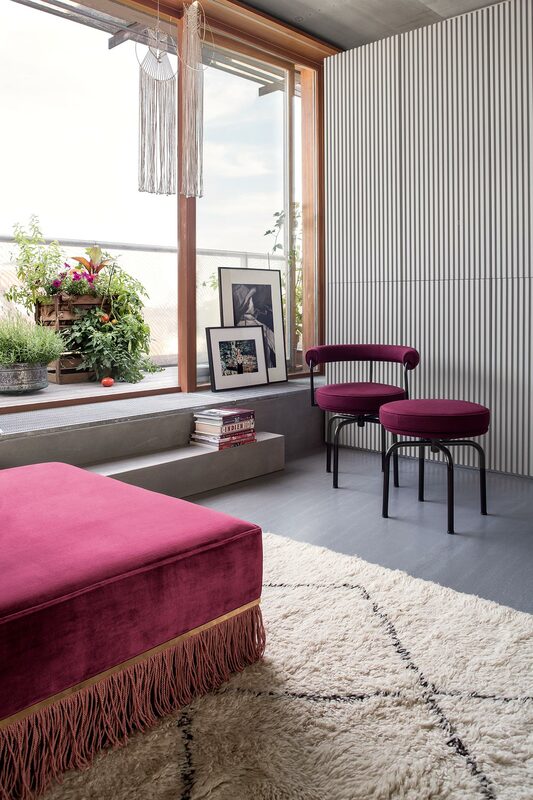 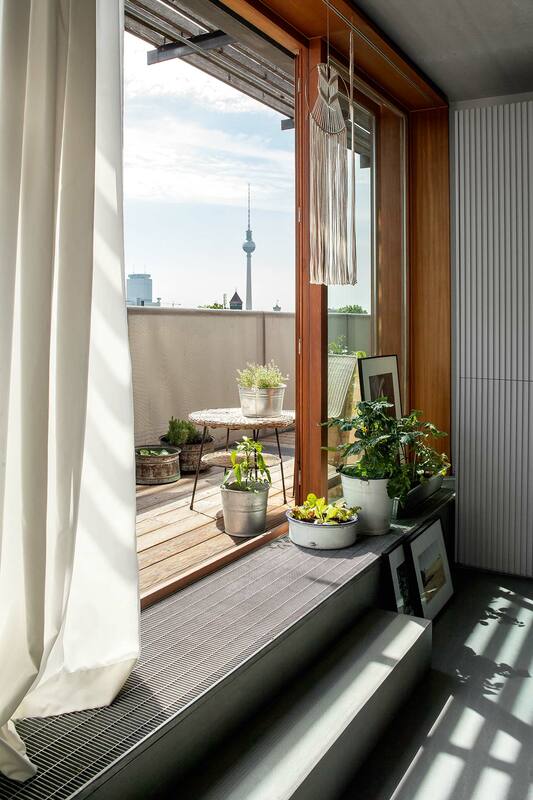 When the opportunity arose for Berlin-based architect Ester Bruzkus to move from the second to the top floor of her apartment building in young vibrant neighbourhood Prenzlauerberg, she jumped at the chance to re-imagine her living space with fresh ideas, not to mention the chance to enjoy panoramic views of Berlin. 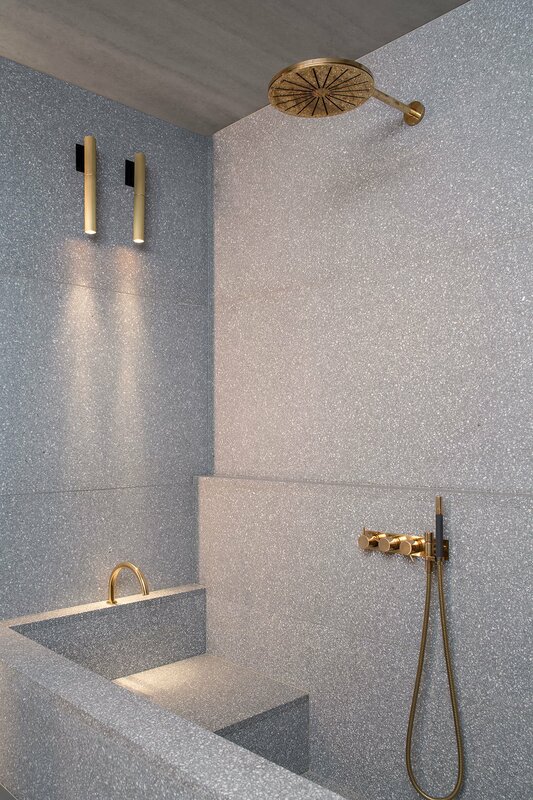 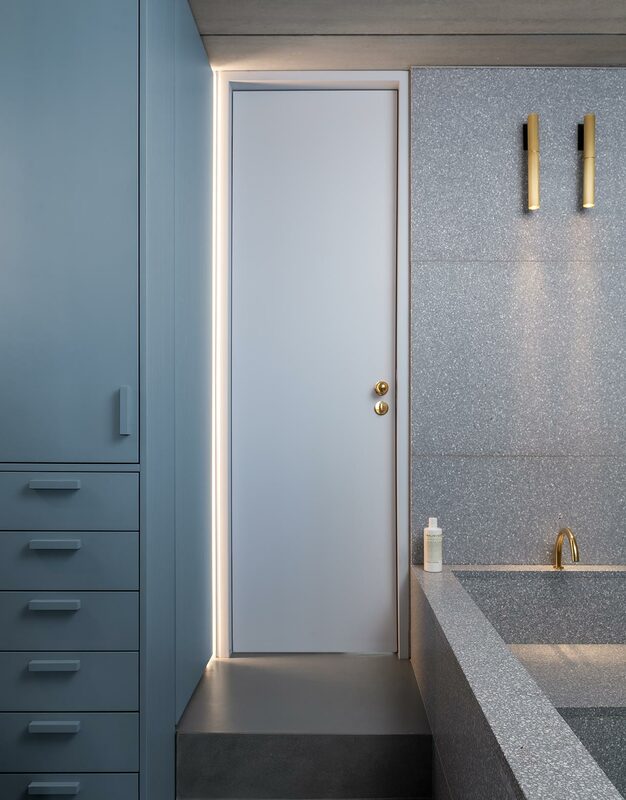 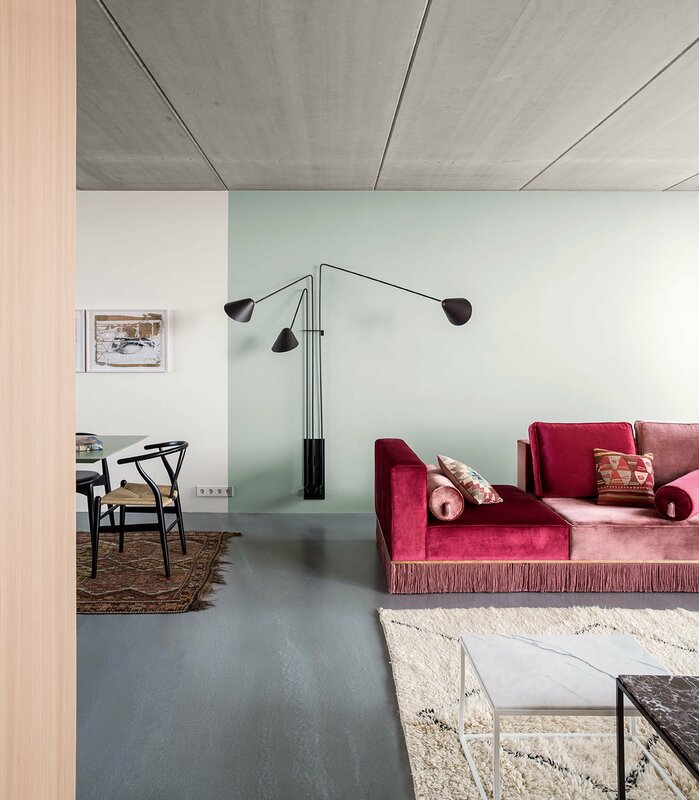 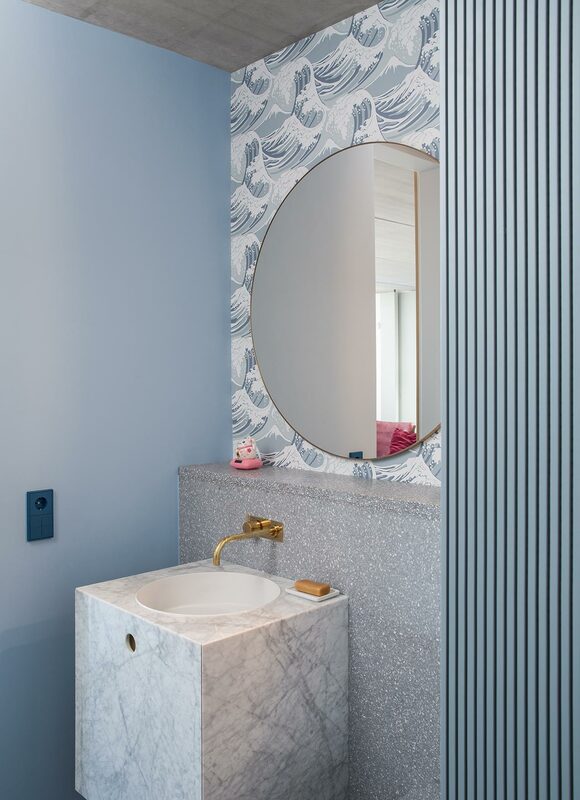 The result is an idiosyncratic apartment that encapsulates all the qualities of Ester’s architecture and interior design practice Ester Bruzkus Architekten: efficient planning, playful material and colour juxtapositions, bespoke furniture, and exquisitely crafted details. 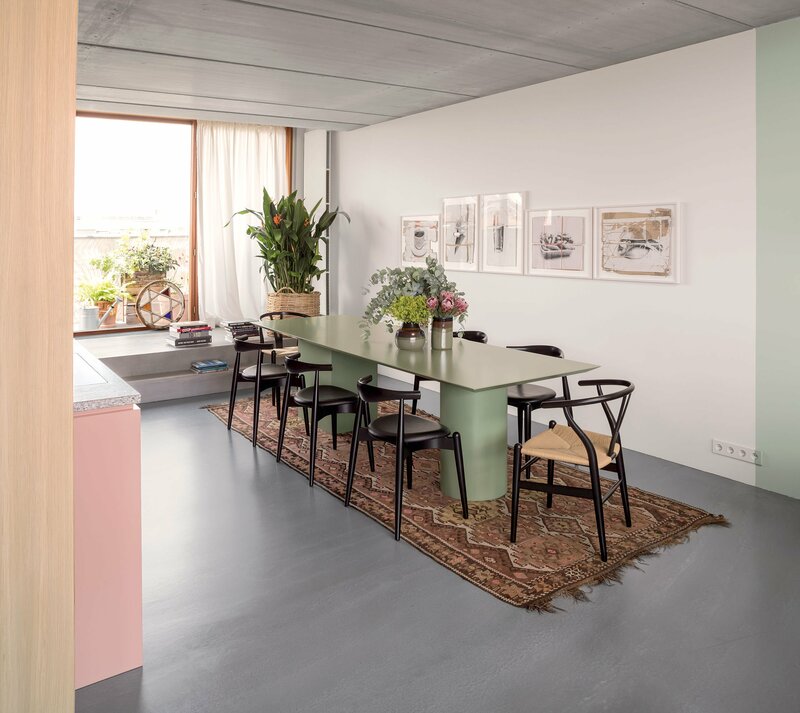 Located in the first apartment building constructed after the fall of the Berlin wall in Prenzlauerberg, the property in its original state was an open-plan loft stretching between the building’s east and west glazed facades, with narrow terraces on both sides. 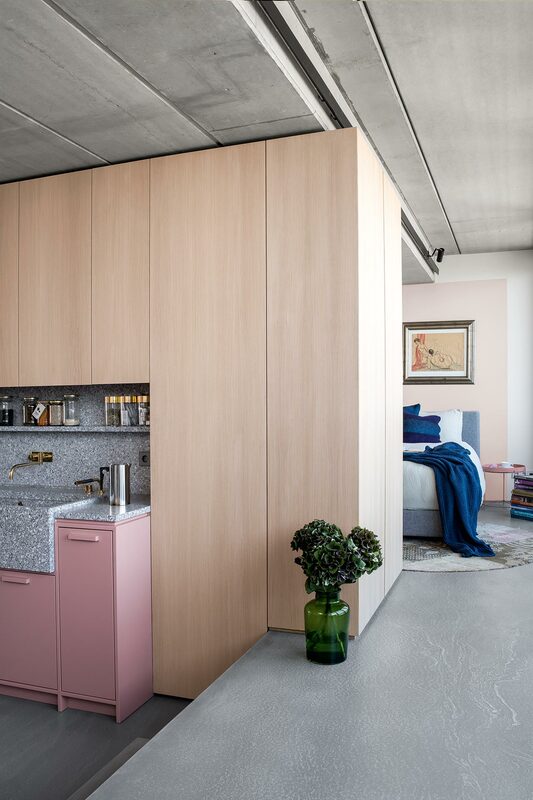 Ester has radically changed this layout by introducing a series of geometric volumes that divide the apartment in separate yet connected areas, and by extending the narrow raised platforms, which run along the length of the wall-to-wall windows, into the interior. 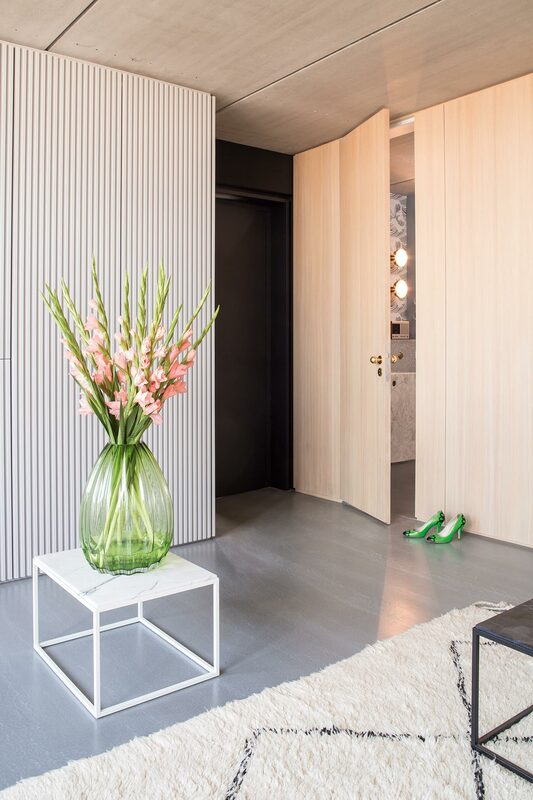 A central structure of light oak conceals the private quarters without interrupting the wall-to-wall windows and has carved out an L-shaped living and dining area. 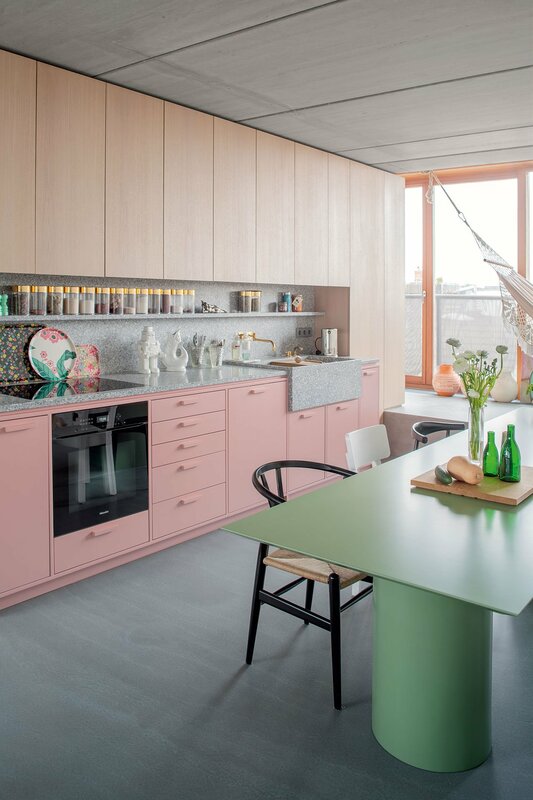 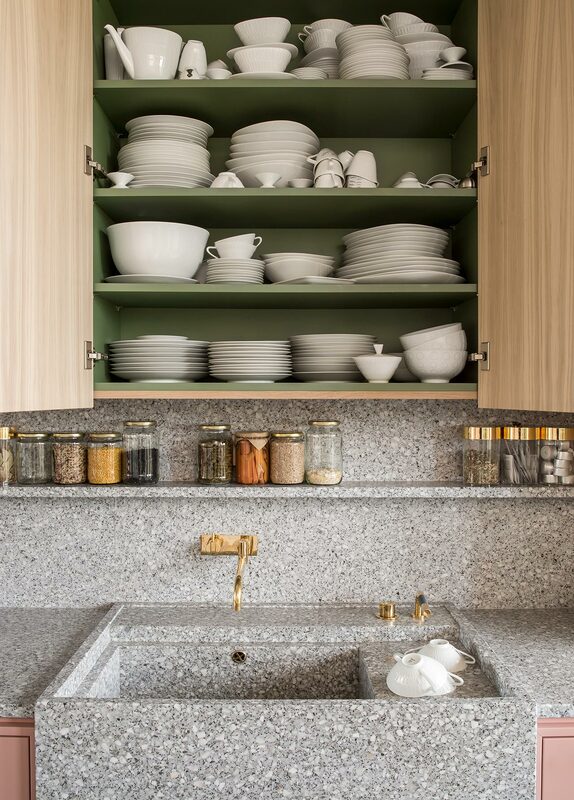 On the side of the dining room, a kitchen unit has been incorporated into the oak structure, featuring a terrazzo worktop and pink cabinets which gracefully complement the adjacent green dining table, a bespoke design whose soft curves taunt the rectilinear cabinetry. 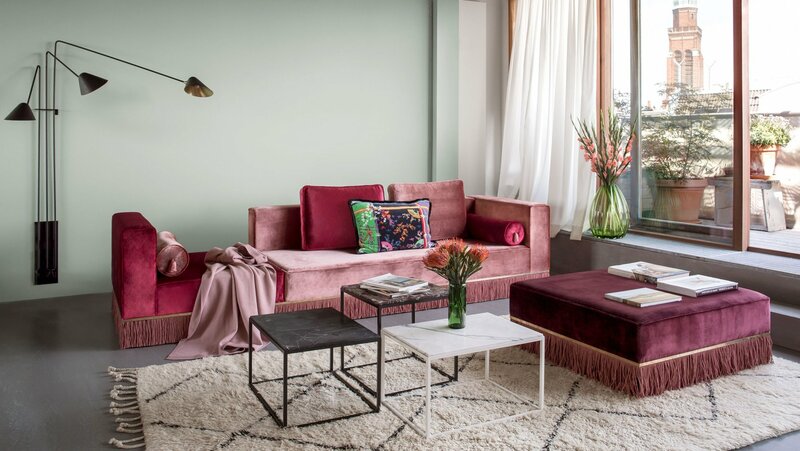 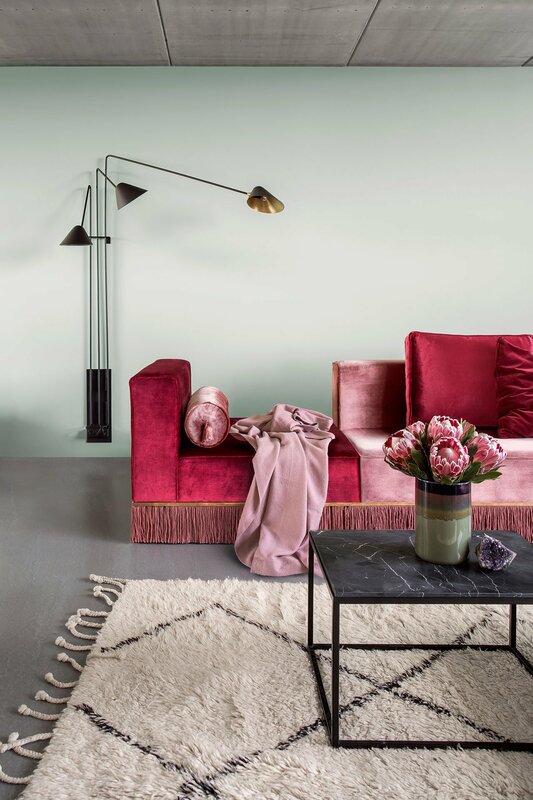 The green and pink shades in the dining area are picked up in the lounge, the former by the colour of a wall section and the latter by the luxurious custom-designed sofa in three reddish pinks. 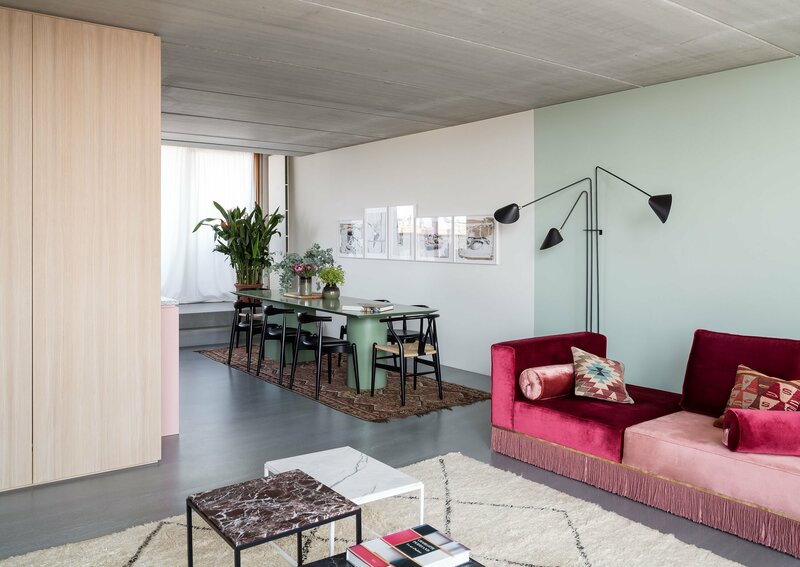 The candy-coloured palette is playfully juxtaposed by the cool concrete floor and ceiling, while the soft texture of the Berber rug is contrasted by the glistening marble of the modernist coffee tables.